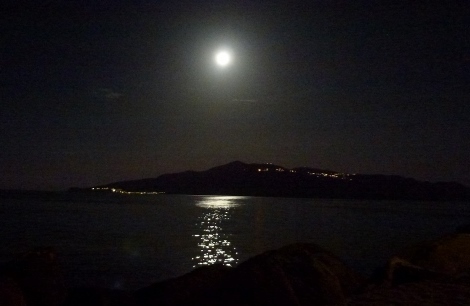 On Tuesday, we left Kalymnos and motored right over to Kos. You could see the island from our spot on the Town Quay and as soon as we sailed out of the harbour we saw several islands and Turkey. 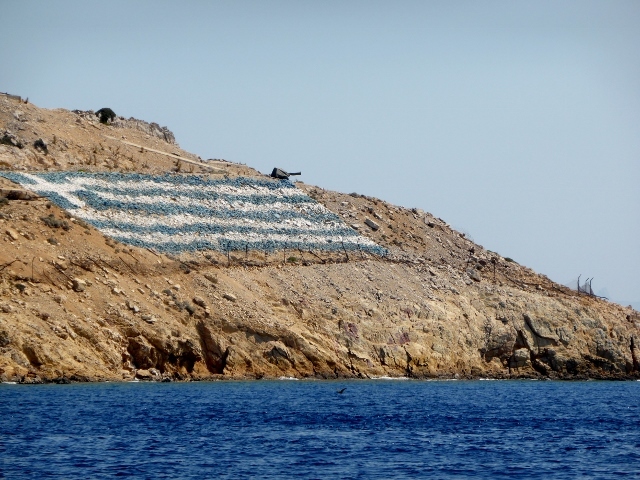 There is a small barren island just a stones’ throw from Turkey and both Greece and Turkey have their large flags facing each other. We wandered the streets of Kos Town less than a kilometer from Kos Marina, which we think is one of the best marinas in Greece. Certainly it has the nicest showers, which is a very important criteria. 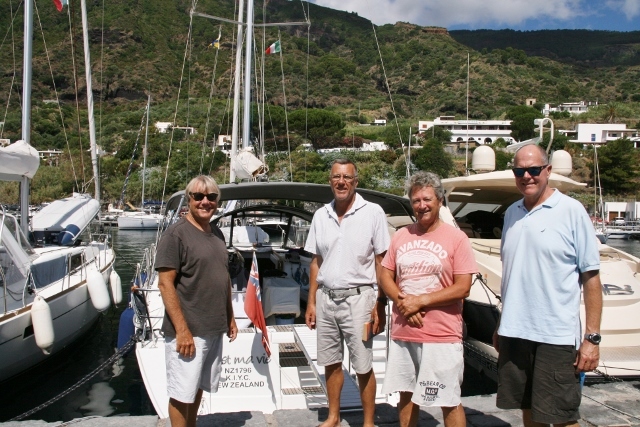 On Wednesday morning, Kate and Mike Rider, friends from Noosa, came into Kos on a cruise ship and visited us on Mercier. We were able to sit and chat, in a beautifully cool breeze and sip our coffees. Mike is always a useful font of Beneteau knowledge and we appreciate his advice. 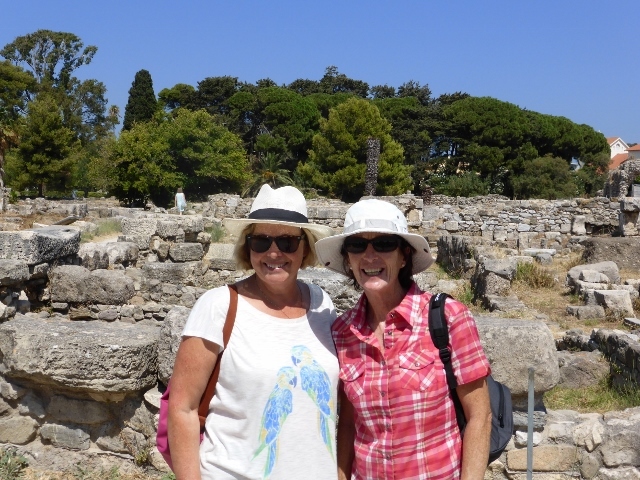 We stopped for lunch at H20 on the way to visit Hippocrates’ Plane Tree, the Agora and the Castle of Neratzia, which is full of ruins from the Knights of St John, as well as Turks, on the foundations of an ancient city. 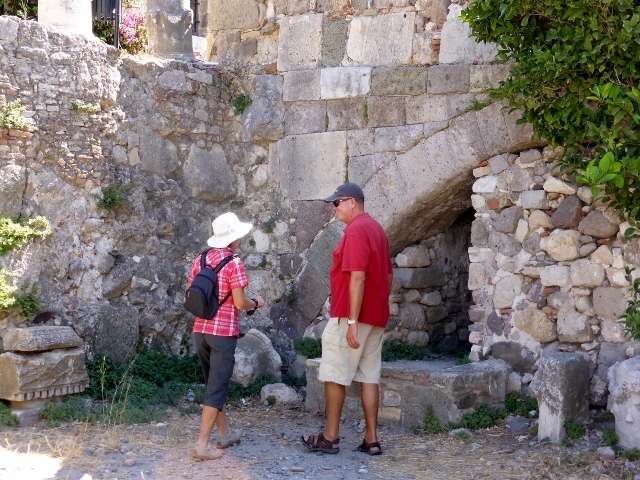 The castle is mirrored on the Turkish Coast by the Halikarnassos Castle, so the Knights of St John could control the Straits between Greece and Turkey. We scrambled over and through both keeps and into tunnels, looking at antiquities, Turkish writing carved into plinths and many heralds over the tops of arches and upper walls. 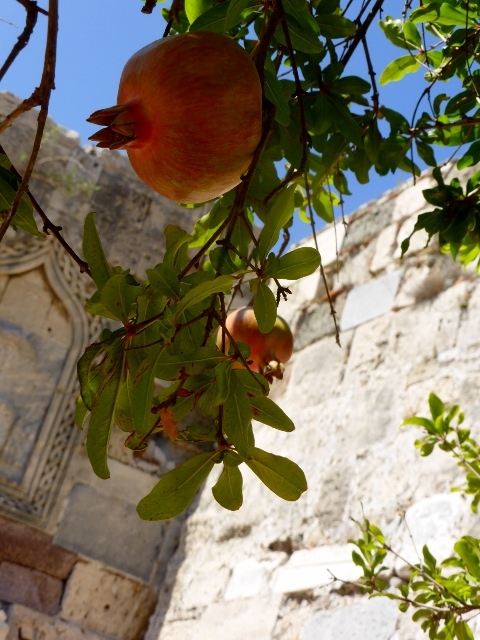 Neratzia is the Greek word for ‘Bitter Orange” according to one website but we only saw capers and pomegranates growing and of course the beautiful views. 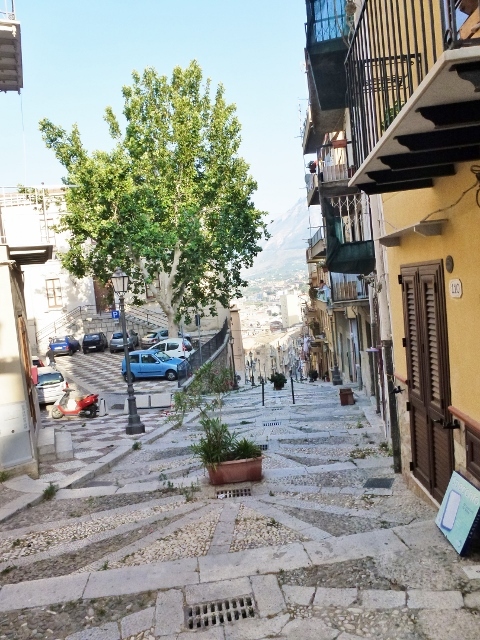 Termini is the next stop out of Palermo, the old town Termini is around the port within city gates, the modern Termini Alta is high on a bastion wall and has wonderful views out over the sea and the lower town. There is train service, which makes it a good port for crew changeover. 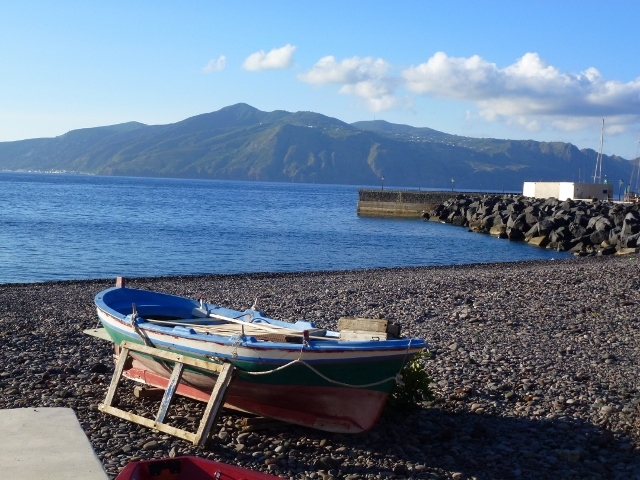 Termini has a very large port and they are upgrading all the facilities and putting the smaller boats in a marina closer to the rocky beach and creating an entertainment district with discotheques and bars in the area. Still work to be done there, but a nice jazz bar on an old boat. There were views to be seen and so we began our walk up the hill, viewing an old Art Deco hotel, we walked over and peeked inside. It had seen better days but was a lovely old hotel. There was a switchback road with stairs and so we began our climb. This is a very workaday town, not really a tourist tidy town. 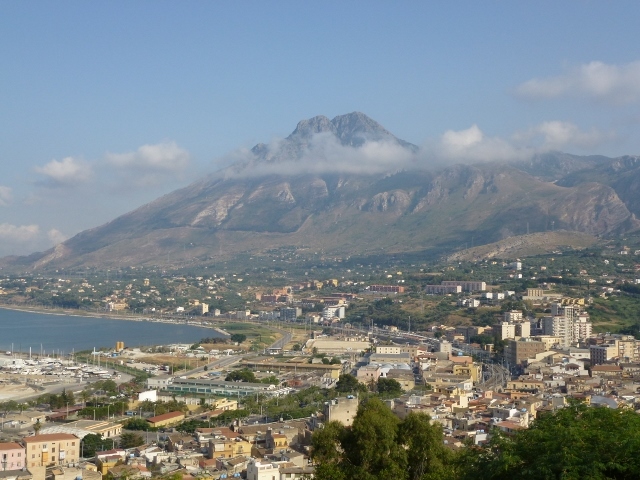 Nonetheless, Termini Alta had a wonderful charm, a lovely walk along the bastion, looking over the port and the mountain, San Calogero which overlooks the town. We were walking down this beautiful street between homes and we turned a corner and all of a sudden we were in the shopping district. Shoes and clothing shops were everywhere, the side walk was about six inches wide, cars had a bit more room. There were surprises around each corner. 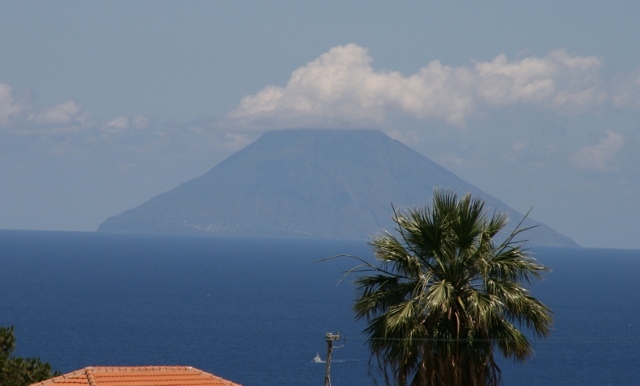 The next morning we had a full ten hours of motor sailing to take us the Aeolian Islands. 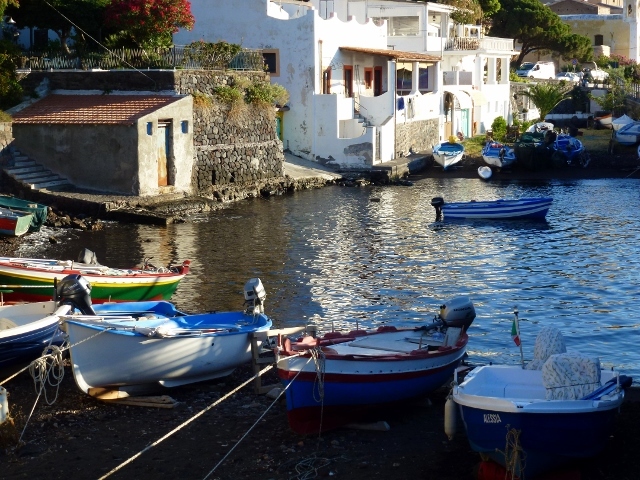 We had planned to anchor in Isola Filicudi but the anchorage would have been exposed to the sloppy swell, so we decided to press on to Isole Salina. It is hard to explain how good it was to be speaking English [of sorts] and also good to share stories about The Wilmots and Davo. Graeme said he had both his legs, because Davo warned him off swimming or windsurfing in Middle Harbour because of all the sharks. I had to tell Graeme about Davo saving me from the Killer Goanna one Christmas holiday, so we agreed Davo knows about dangerous animals. Crikey, there might be a job for Davo in TV. *PS note the change of surnames for Brian and Neil. Our wonderful neighbours, John and Jenny, who are originally from NZ, emailed to tell us we had the surnames wrong. They identified Neil and told us what a top bloke he is. Two degrees of separation.